We've been in the center of the storm of GLBTQ inclusion in our faith lives for many years, totally and lovingly embraced by our community of faith, but part of a bigger denomination that bitterly fought over whether GLBTQ people should be included at all, let alone ordained. We've had a lot of practice going over what some call the "clobber passages" referred to in sacred texts. We're at peace with what we believe but so many people are still wondering whether one can be faithful AND GLBTQ. 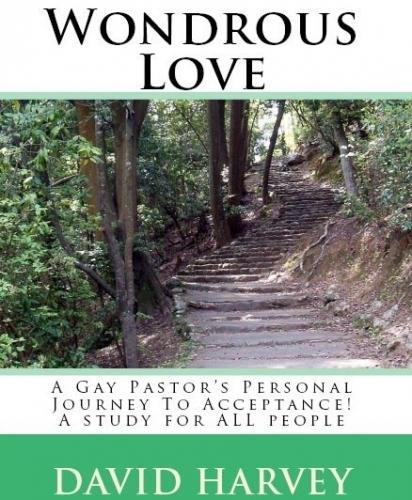 Pastor David J. Harvey has put together a compelling book in which he shares his personal journey, his understanding of the sacred texts and their historical context, and affirms that yes, you can be both faithful and GLBTQ. The book is a breath of fresh if irreverent air on a subject hotly debated for a long time but rarely covered in such an engaging way. 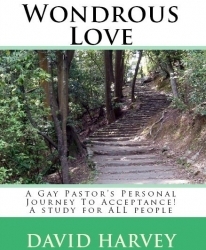 As scholarly and solidly based in scripture as required to be taken seriously, but also as deeply personal as a book about one's walk with God also needs to be, Wondrous Love takes on the topic of what the bible really says about homosexuality, AND, how people can be both GLBTQ AND faithful, in a compelling and thought-provoking way. Some even among the GLBTQ faithful and their allies may take exception to some of the author's conclusions and suppositions, but that makes the book even more engaging and edgy and worthy of discussion. This book was born from years of research, study and teaching on the topic of Homosexuality, and what the Bible really says about it. Straight people will gain a fresh understanding of the journey that many gay Christians encounter, and gay and lesbians Christians will find a companion who identifies with their hurt and rejection from the mainline churches across the country. While there is much confusion in the Christian world as to what the Bible says about homosexuality, there is great clarity about how Jesus instructed His followers to walk in love. Hopefully, you will find renewed acceptance in your faith and a reason to celebrate your sexuality as you read how you are created; to be the gay or straight child of God. You too can find that Wondrous Love!